Above top: The Rev Martin Upton conducting the wedding blessing for David and Pip Pointon on August 18 2018. 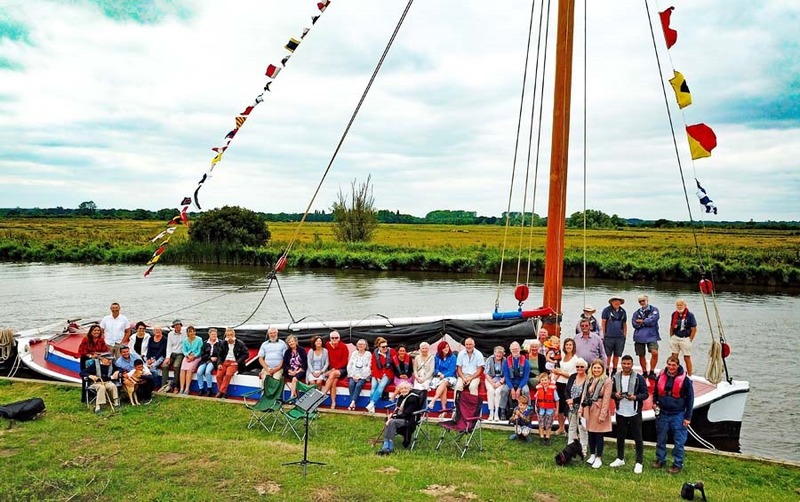 The second photo of the wherry Albion and the wedding blessing group was taken by Eddie Land using a drone camera. The Albion’s volunteer crew is on the foredeck. This could well be the first time that The Albion has been chartered for a wedding blessing ceremony. Click on the top picture to see more photographs. 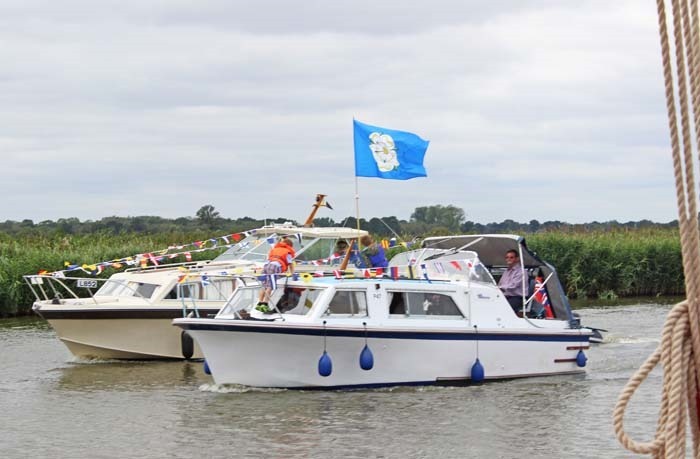 A special flotilla set out from Thurne in North Norfolk on Saturday August 18 as four boats followed in the wake of The Albion – the 120-year-old wherry we had hired for our wedding blessing. Two of the boats – Jim Bondi’s Karina and David Bondi’s Quixote (below)– were dressed overall with flags. This gave me a wonderful opportunity to take some photos of four generations of the Bondi family. 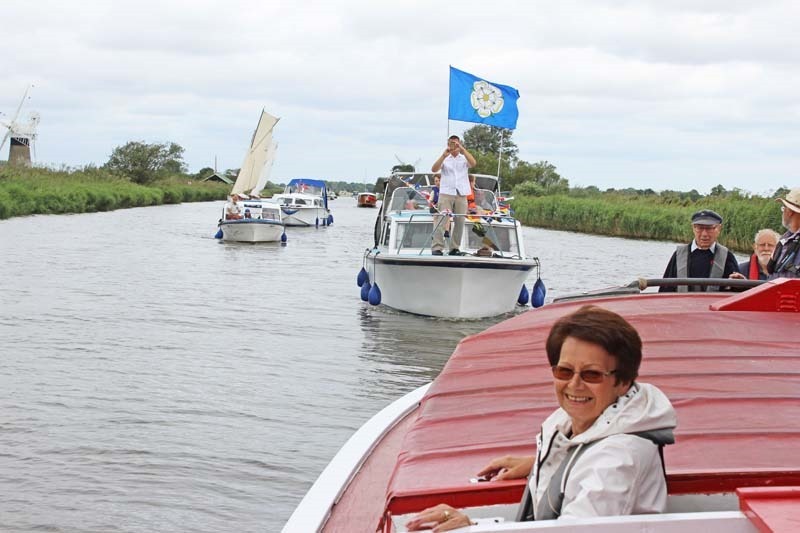 When we began our journey on The Albion from Womack Staithe the skipper, Roger Watts, kindly invited me to take the tiller – an honour I couldn’t refuse. But just as I reached the stern of the wherry I looked up and saw John Wayne very determinedly making his way carefully down the port side assisted by a crew member. John is the 94-years-old grandfather of David and Chris Bondi. Chris was with his wife, Emma, and their three children on Karina – and another of John’s great grandchildren was on Quixote. John was a very successful sailor when he was younger and was very happy to be at the helm of The Albion. It was so special to watch him do so in style all the way the Norfolk Wherry Trust’s base at Womack Water near Ludham to the site of the medieval abbey of St Benet’s. Above: Karina following us, with John at the helm of The Albion and his daughter, Sally, in the foreground. David and I were with nine family and friends on The Albion with another 22 on the other boats. At St Benet’s The Albion went to the Bishop’s Mooring which gave us a private location for the wedding blessing. Karina and Quixote were moored beside us with the other two boats using the free moorings a short walk away. Originally we had planned to hold the wedding blessing at the cross which marks the site of the abbey’s altar. But it would have been very difficult for our two oldest guests, Marjorie Hawkings and John, to have walked there. Marjorie had also travelled with us on The Albion. For some (including David and I) the next half an hour of our blessing was even more moving thanks to Amy Bondi (David Bondi’s wife) as she sang Stand by Me and Hallelujah and other songs. There was also a lovely duet thanks to Liz Burrage and Amy. 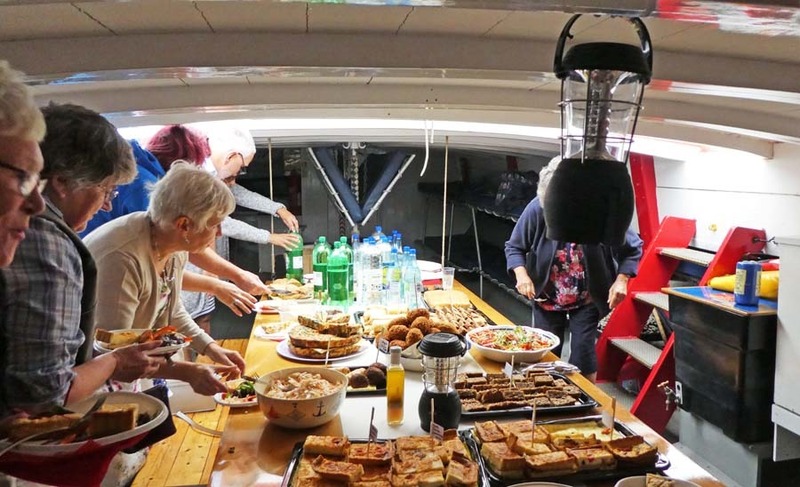 Then it was time to enter the hold of the wherry to fill our plates (below – photo by Martin Upton) with the wonderful food made by Claire and Anita at The Galley in Horning. Several of our guests described the enormous homemade scotch eggs as the best they had ever tasted. David said the vegetarian quiche and scotch eggs were also excellent. And the sweet potato and spinach frittata were mouth-wateringly memorable. Claire and Anita had made sure there was a special platter of food for me (including a cheese-free frittata). They had also ensured that their delicious tray bakes were free from cow’s milk products. We had collected this feast from The Galley that morning – with the help of my son, Eddie, and his girlfriend, Steph. We made sure that Marjorie and John received plates of food as neither could have got down into the hold. And thankfully it was neither too hot nor raining. After Amy had sung some more songs Chris Bondi took John back to Thurne on the day boat. This was driven for us by Mark Olive. So, at last, it was time to cast off and head back to Womack Ferry. I peered down into the hold, saw the chaos left behind after everyone had eaten – and decided that tidying up would have to wait. I just wanted to stay up on deck and enjoy being on The Albion. The Bondis went ahead of us so that they could wave to us as we passed Thurne dyke. Then we had to lay on our backs while the sail was lowered. (Below – photo by Martin Upton). When we were moored at the wherry station I looked into the hold again and was astonished to see that the long refectory table was spotless! Everything was so clean and tidy – thanks to David’s daughter, Alex, and Serena. That was a lovely wedding gift! So many thanks to The Albion crew that day: Roger Watts, Andy Brooks and George Blake with emeritus crew Ivor Stemp. We were running late and had booked a table at The Lion at Thurne for 6.30pm, so the food containers were quickly packed into the back of David’s car. Ken and Pat and our family guests joined us for the evening meal even though most of us weren’t that hungry. As it was such a nice evening we could sit out in the garden which was fortunate as my nephew, Euan, and his girlfriend Lois, had brought their dog, Dopey, with them. For us the party didn’t end that evening. Next day we spent a lot of time with Jim, his wife Sue and her cousin, Hilary, and also with David and Amy Bondi and their son Dylan. We waved at The Albion as it passed us that morning with any group of volunteers crewing it. Quite late that afternoon I went to Thurne to return the food containers to The Galley. When I opened the boot at Horning I was very dismayed to find that the large salad dishes weren’t there. I apologised to Claire and then went to the wherry station to await the return of The Albion. After about half an hour I saw a couple come out of one of the huts there carrying those salad dishes. Claire had phoned the Norfolk Wherry Trust and the Humphries had come to find those dishes. It was such a relief to see the bowls handed over to Claire’s husband when he came to collect them. The Humphries told me that in all their years as volunteers with the Norfolk Wherry Trust they could not remember any other occasion when The Albion was chartered for a wedding blessing like ours. Our party could then happily continue. David’s cousin, John with his wife Debbie, had their camper van at Thurne and my brother Dave, with his wife Leigh, daughter Sian, with Euan and Lois and Dopey were camping at Obi Dyke nearby. On the Friday evening they had joined us for a BBQ on the moorings beside David’s boat, Edna May. David had hoped to take them on lengthy boat rides on Edna May but during the week before the wedding blessing neither he nor Jim could find why the engine was overheating. So on the Monday after the blessing we took Debbie and John on a very slow boat ride to South Walsham Broad and to Ranworth . Even at three mph there was more steam than water pouring out of the exhaust and a Broads Authority inspector hailed us thinking we hadn’t realised there was a problem. It was a perfect day for boating – and after a pleasant walk to visit Ranworth church John and Debbie spent an hour of so together on the foredeck relaxing, and enjoying the scenery and the wonderful skyscapes. On the Wednesday – on yet another sunny day – we took Dave, Leigh, Euan, Lois and Dopey to South Walsham and found a mooring where the dog could be taken for a walk. Sian missed out on that trip because she had to return to north Kent for a teacher training college interview. We had time on Thursday to take Edna May slowly to Potter Heigham to visit a boat-doctor: Harry May. David told him all that had been checked so far … and within 20 minutes Harry had found a pipe which had become blocked. It didn’t take long to clean it out – and Edna May happily chugged along with the temperature barely touching 70 degrees all the way back to Thurne. What a relief! And finally, on the Saturday, it rained. But by then we could sit back and enjoy so many happy memories – thanks to all our wonderful friends and family who had helped us to make it such a very special week.